Fiona Flynn scored eight points Tuesday to become the Cinnaminson girls' basketball all-time leading scorer in a 61-34 triumph over Delran in the South Group 2 first round. The senior passed 2014 graduate Najha Treadwell's mark of 1,193 points. Kayla Caban made five threes for 26 points for the Pirates. Cinnaminson will play Barnegat in the quarterfinals on Thursday. 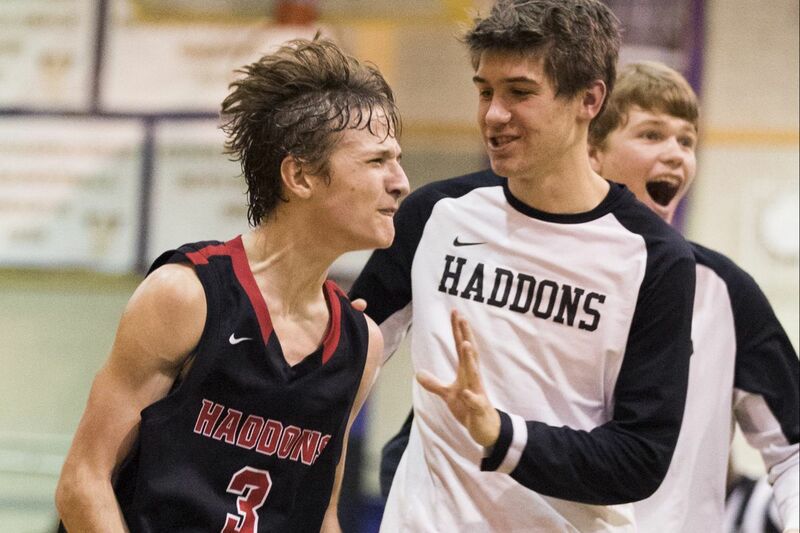 In other Group 2 action, Keegan Douglas recorded 19 points as Haddonfield beat Oakcrest, 44-28. Annie Stanton contributed with 10 points for the Bulldogs. Haddonfield will play Middle Township on Thursday. Jazzy Duverglas scored 23 points and eclipsed 1,000 for her career in a 62-18 win over Haddon Heights. The Pirates will play Sterling on Thursday. Latanya Berry netted 22 points to lead Medford Tech past Sterling, 65-24. The Jaguars will play Cedar Creek on Thursday. Bella Runyan poured in a game-high 33 points to lead Moorestown Friends to a 63-40 victory over Mater Dei in the South Non-Public B first round. Alyssa Runyan added 12 points for the Foxes. Moorestown Friends will play No. 1 seed Trenton Catholic in the quarterfinals on Thursday. In other Non-Public B action, Victoria Sciortino scored 11 points as Holy Cross topped Wildwood Catholic, 46-32. Hannah McHugh and Ava Taylor each had eight points for the Lancers. Holy Cross will play No. 2 seed Rutgers Prep on Thursday. Kayla Williams finished with 20 points as Rancocas Valley held off Williamstown, 58-53, in the South Group 4 first round. aylin Vandunk contributed with nine points for the Braves. Williamstown plays the winner of Jackson Memorial and Atlantic Tech in the quarterfinals on Thursday. In other Group 4 action, Kendall Keyes led all scorers with 19 points as Lenape knocked off Washington Township, 52-37. Shannon Mulroy pitched in with 13 points for the Indians. Lenape will play top-seeded Cherokee on Thursday. Ethan Tarte and Myles Thompson scored 17 points apiece as Camden took down Overbrook, 80-44, in the South Group 2 first round. The Panthers will play Sterling in the quarterfinals on Thursday. In other Group 2 action, Craig Turner scored 21 points as Cinnaminson defeated Collingswood, 66-49. The Pirates will play Barnegat on Thursday. Jaden Wallace had 29 points for the Panthers. Coley Holton's 12 points wasn't enough in Middle Township's 50-45 loss to Barnegat. Chris Roe put up 29 points as Sterling cruised to a 72-51 victory over Willingboro. Noah Syer added 18 points for the Silver Knights. Sterling will play Camden on Thursday. Mike Depersia tallied 14 points, seven assists, and five steals as Haddonfield upended Cape May Tech, 62-44. Dylan Heine paced the Bulldogs with 15 points while Dan Fleming added 10 points added 10 pointd and six rebounds. Haddonfield will play Haddon Heights on Thursday. Dean Noll led Shawnee with 21 points in a 68-38 win over Southern Regional in the South Group 4 first round. Dylan Deveney added 18 points for the Renegades. Shawnee will play the winner of Kingsway and Williamstown on Thursday. In other Group 4 action, Millville topped Lenape, 62-52, thanks to 24 points from Rynell Lawrence. Terrell Davis contributed with 20 points for the Thunderbolts. Head coach Mike Jones also picked up his 100th career victory. Andrew Sims led the Indians with 30 points. Millville will play Atlantic City on Thursday. Jayvon Laster led a balanced Rancocas Valley attack with 15 points in a 58-34 victory over Brick Memorial. The Red Devils had 10 scorers in the game. Rancocas Valley will play Eastern on Thursday, who edged Cherry Hill East 58-56. Jacquey Mendez recorded a game-high 20 points as Bordentown knocked off Raritan, 60-49, in the Central Group 2 first round. Jordan Martin contributed with 17 points for the Scotties. Bordentown will play the winner of New Providence and Roselle on Thursday. Caleb Fields scored 18 points as Wildwood Catholic defeated Moorestown Friends, 74-38, in the South Non-Public B first round. Taj Thweatt added 17 points for the Crusaders. Wildwood Catholic will play the winner of Holy Spirit and Immaculata in the quarterfinals on Thursday. In other Non-Public B action, Nico Ferrari's two free throws with eight seconds to lift No. 11 seed Gloucester Catholic over No. 6 seed Timothy Christian, 64-63. Ferrari finished with a game-high 22 points while Conor Regan chipped in 17 points and nine rebounds for the Rams. Gloucester Catholic will take on the winner of Mater Dei and Holy Cross on Thursday. Mike Schatzman was named the new football coach at Washington Township High School at a board of education meeting on Tuesday night. Schatzman is a 2010 Washington township graduate who excelled at football and baseball for the Minutemen. He is a health and physical education teacher in the district and has been an assistant coach in both football and baseball. Schatzman was the head coach of Washington Township's undefeated freshman football team in 2017. He replaces Lamont Robinson, who resigned after one season.